This new set is custom designed for the Hasegawa Japanese battleship Mikasa kit and contains the following items: custom fitted and pre-shaped main deck railing featuring "drooped-chain" detailing and with pre-positioned cutouts for chocks; specialized and pre-sized railing in all the correct styles for all upper decks with choice of simulated canvas-covered or non-canvas-covered styles; watertight doors in all the correct sizes and in several styles; inclined ladders in all required sizes; vertical ladders; two accommodation ladders with perforated platforms and associated rigging; relief-etched replacement bridge wing supports and mast top supports; pre-shaped footropes for all four yardarms; fold-to-shape forward and aft bridge pilot houses with see-through windows and separate doors; helm and binnacle for interior of pilot house; pre-shaped handgrabs and funnel cap grilles for both funnels including an alignment jig to ease assembly; pre-shaped perforated catwalks for both sides of the hull; relief-etched gunport covers for gun casemates; rudders, oars, and chocks for ship's boats; turnbuckles, eyebolts, and pulley blocks for custom rigging work; highly detailed skylight covers in several styles; two pre-shaped ladder well railings for gun decks; detailed captain's walk with accurate handrails and relief-etched ship's nameboard; three anchor hawsepipe screens; anchor handling hardware; and a 3-D relief-etched figure of Admiral Togo in full uniform with sword and binoculars. Numerous spare parts are included in the event of loss or damage. 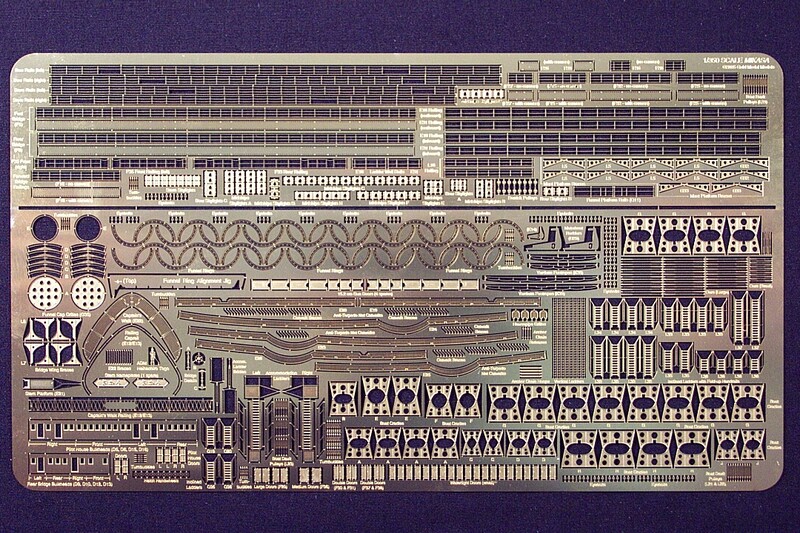 This set will provide nearly all the fittings required to completely detail the Hasegawa kit. SEE PHOTOS AND REVIEWS OF GMM'S 1/350 MIKASA DETAIL SET!